Our church has had an unusual amount of heavy duty prayer needs the past three months. Bam...Bam...Bam. One after another. Unrelenting. Multiple new messages coming across prayer chain daily. So much so that our pastor set aside a special service this morning for all of us to have prayer together in small groups. Several people got up and shared scripture passages encouraging us in our faith, many said with tears. It is hard when dear friends are hurting. Some families with multiple struggles of sickness, death of a child, cancer and surgeries. The passages shared are ones I also love and have underlined in my Bible. They are passages I cling to when hurting or sad. Bible pages worn and tattered that speak to us. The following passage in 2 Corinthians has been underlined, highlighted, circled and tearstained on more that one occasion in my Bible. I think as a believer in Christ, one who claims His promises and knows He sees my many flaws, I am humbled that the God of the universe wants to use my clay vessel for His use. How can that be? I am not sure I am up to the task... but I claim His promises and KNOW He is sovereign and He KNOWS what He wants and WHOM He wants to use to accomplish His will. Excerpts from verses 7-16. 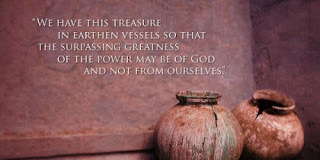 "But we have this treasure in earthen vessels, that the surpassing greatness of the power may be of God and Not from ourselves; we are afflicted in every way, but NOT crushed; perplexed, but not despairing; persecuted, but not forsaken; struck down but not destroyed... Therefore, we DO NOT LOSE HEART, but though our outer man is decaying, yet our inner man is being renewed day by day. For momentary light affliction is producing in us an eternal weight of glory FAR beyond all comparison. While we look not at things which are seen but things which are not seen, for the things which are seen are temporary but the things which are NOT seen are eternal." Why use a clay pot to accomplish big things? God needed to use something expendable to show His power and that salvation was of Him and not of us. Our body slowly decays and then perishes but the inside self of a believer grows and matures into Christlikeness. So while there is sickness and death, and we cry and lament. He is sovereign. 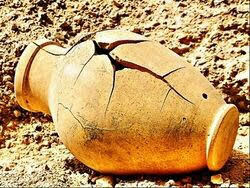 He is working on this clay pot and He will use it as He pleases because He is a mighty and powerful God.